"This sweet and spicy chutney is great over scallops or chicken." 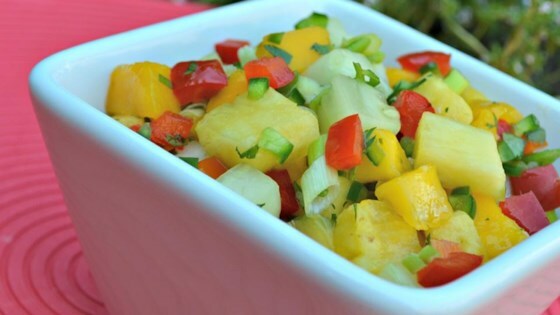 Mix pineapple, mango, cucumber, red bell pepper, lime juice, green onion, jalapeno pepper, mint, and salt in a bowl. Chill in refrigerator for about 1 hour before serving. added 1/4 cup orange marmalade. also tried it with apricot chutney, awesome. Quick and tasty. I used it on fish and complimented the tuna wonderfully. I found this dish refreshing. Easy to make,tastes great and worked well over pork chops. Bonus - it is so healthy! Very refreshing. Did not have mint but still tasted great.